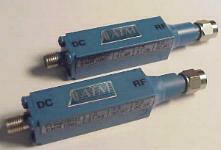 Microwave RF Noise Source generators supply white gaussian electronic noise for RF systems. The output is a flat instantaneous broadband electronic random noise. The RF noise source converts a DC input to white noise. Microwave ENR noise generators are available in bands between 10MHz thru 26.5 Ghz. The RF noise source provides a small, efficient source of RF energy. It has long term stability & reliability and can operate over a wide temperature range. ATM offers Microwave Noise Generators which can be used in a variety of applications including Noise Figure Measurement, Jamming for military purposes, and Self Test for radars and other systems. Please call us with your requirements and discuss your needs with one of our design engineers. Input power +28 volts, 25ma. max. Input voltages as low as 15 volts are available in most models, consult factory for details. Since noise sources have broadband output levels of power they must be rated per bandwidth. An alternate way of rating noise output levels is in dB ENR. The above referenced levels are approximately 30 dB ENR and 15 dB ENR respectively. ENR is used for Excess Noise Ratio. Higher outputs can be attained by means of amplification. Other options exist at very low frequencies. Noise diode is hermetically sealed. All housings can be supplied with threaded mounting holes. DC INPUT: BNC (F) CONN.
RF OUTPUT: SMA (M) CONN.
*R or S, X or Y, T or V packages may be interchanged depending on input connector requirements. Model number is modified by changing the suffix letter. RF OUTPUT: TYPE-N (M) CONN.
*Models offered in package Z are only available in this package, no X or Y substitution can be made. DC INPUT: SMA (F) CONN.